Trader Fran O'Connell works on the floor of the New York Stock Exchange. The Dow Jones industrial average rebounded sharply on Monday following a report of U.S.-China trade talks. The Dow Jones industrial average closed up 669 points, or nearly 2.8 percent, to 24,203. The S&P 500 index climbed 70 points, or 2.7 percent, and the Nasdaq gained 228 points, or 3.3 percent. Last Thursday and Friday, the Dow lost more than a total of 1,100 points amid increasing signs of a looming trade war between the two major trading partners. "The talks, which cover wide areas including financial services and manufacturing, are being led by Liu He, China's economic czar in Beijing, and U.S. Treasury Secretary Steven Mnuchin and U.S. trade representative Robert Lighthizer in Washington. "In a letter Messrs. Mnuchin and Lighthizer sent to Mr. Liu late last week, the Trump administration set out specific requests that include a reduction of Chinese tariffs on U.S. automobiles, more Chinese purchases of U.S. semiconductors and greater access to China's financial sector by American companies, the people said. Mr. Mnuchin is weighing a trip to Beijing to pursue the negotiations, one of these people said." 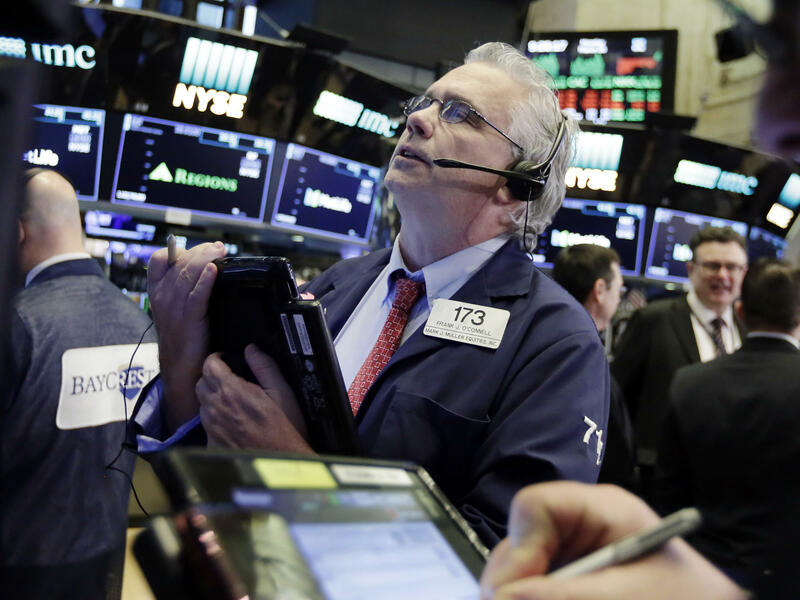 Stock indexes around the world fell last week as the Trump administration prepared to impose stiff tariffs on Chinese imports in a bid to cut the U.S. trade deficit with China by $50 billion. "The tariffs on China are a response to long-standing complaints that Beijing unfairly requires U.S. companies to share their technology as a cost of doing business in that country," NPR's Scott Horsley reported. The Chinese government announced a list of retaliatory tariffs it would impose on about $3 billion worth of U.S. exports, in response to a separate set of U.S. tariffs on steel and aluminum imports. President Trump on Thursday signed a temporary exemption — until May 1 — from the steel and aluminum tariffs for Argentina, Australia, Brazil, South Korea, Canada, Mexico and the European Union. Speaking Monday on Morning Edition, former U.S. Treasury Secretary Lawrence Summers said the U.S. should focus "on what is a major issue ... the forced transfer of valuable U.S. technologies to Chinese firms, and not concentrate on issues that are probably counterproductive for the American economy anyway, like steel." Tariffs on steel and aluminum could hurt other manufacturers that use those metals to make everything from aircraft to Hershey's Kisses.